Figure 27: shows the long pelvis, with the upper thigh set on at a right angle to it. The lower thigh (shinbone) is of such length that the hock joint stands just clear of the back of the thigh. The foot bones stand vertically, up to the hock joint. The correct angulation can be gauged by the width shown by the dotted lines. Figure 28: shows the correct hindquarters from behind, with good width. The hind legs are lighter in bone and the feet are smaller than the front ones. Figure 29: shows a short pelvis and upper thigh set at an angle greater than 90 degrees. The lower thighbone is also too short. The back of the thigh overhangs the hock in this case. The dotted lines show the narrowness of this construction. This will result in cramped movement. Figure 30: shows the same angulation, but with a more normal length of lower thigh, resulting in the hocks projecting too far behind the thigh. Figure 31: shows narrow hindquarters, with the legs too close together and the feet turned outwards. Figure 32: shows the pelvis bone set too sloping and with a long lower thigh and long foot bones, resulting in a “sickle-hock”. Note also, the low-set tail. 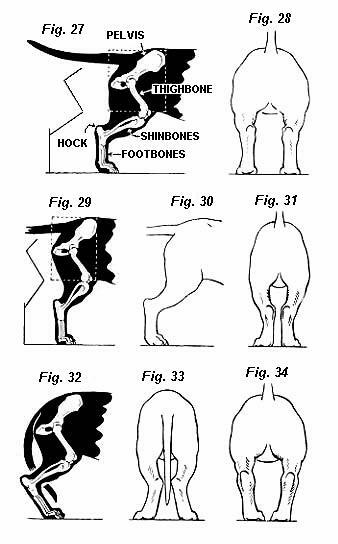 Figure 33: shows “cow hocks”, with the hock joints close together. Figure 34: shows “bandy hocks”, with the feet turned inwards.